The secret to saving money isn’t always in the best deal you find. Sometimes spending a little more money right now can end up saving you more money in the long run. 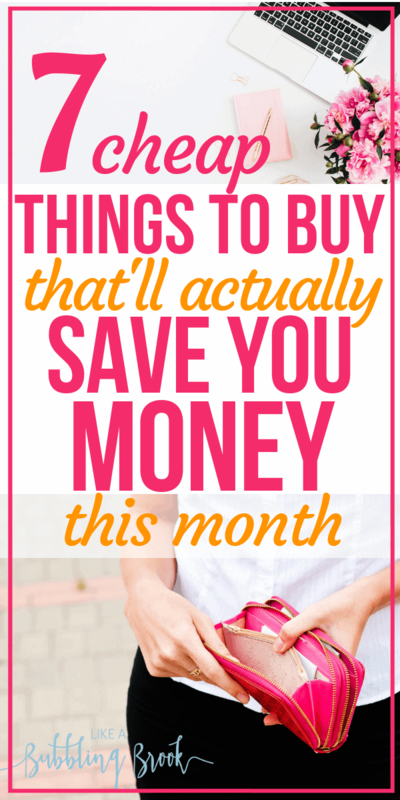 Here are 7 cheap things to buy to save money this month. Ask for them as Christmas gifts, birthday gifts, or simply buy them for yourself right now! If you don’t like the taste of tap water, I completely understand. However, bottled water is not only wasteful, but extremely expensive! Brita filtered pitchers are especially affordable during the holiday season, and you can have fresh water for next to nothing! The only thing you need to replace are the filters, and even those don’t need to be replaced that often. The meal plan Dave Ramsey recommends, eMeals, offers a special budget meal plan. For a small fee, they’ll even send your meal plan’s shopping list over to a local store (like WalMart!) and have your groceries ready for pick-up. This is so easy and it eliminates impulse purchases in the store — I love it! You can save so much money! Click here to learn more about the eMeals budget plan. This can help you save big on your electric bill! Using a programmable thermostat can help you save money while you’re away from home or asleep, and still get to keep it at a comfortable temperature when you are at home. Some might be a little more pricey, but you don’t need to spend a ton. This one by Orbit is well-reviewed and quite affordable! If you own a Keurig, invest in a reusable coffee filter. They’re not very expensive, but they allow you to drink ground coffee without a real k-cup! Ground coffee can be bought for waaaay cheaper than a k-cup and you can still enjoy your gourmet coffee from home. If you struggle with cooking dinner or eating out, a slow cooker could save the day! This allows you to let your food cook all day so you have dinner ready right on schedule. No more cooking after you’re worn out from a long day, or needing to prepare something for dinner in a pinch. This tool will start saving you money on not only eating out, but also the cost in electricity, since heating up your oven can heat up your home and cause your AC to work overtime. I like the ones that let you lock down the lid, like this one on Amazon. These are all the rage right now. It’s like an electric pressure cooker, and helps you get food on the table faster, eliminating the desire to run to the drive through quite as much. You can get them fairly cheap if you catch a sale during the holidays — I’ve seem them as low as $59. With this monitor, you can see how much of a power load your electrical devices are pulling through the wall outlet. If you discover devices that are pulling a significant load, unplugging them will save you money over time. As you can see, even just $20 can go a long way into future savings with some of these purchases. If you’re really looking to maximize your savings, consider buying some of these products. What are some other things to buy to save money? What have you tried? Let me know! New to my site? I love to share ways to get out of debt, save more money, and make extra money from home. You can take a look at my recommendations page for products and web sites I use to do that! Mvelopes: This is the online budgeting program we personally use and LOVE. In fact, we purchased a lifetime membership several years ago when they offered it to us. It’s like a virtual cash envelope system, and it syncs with your bank accounts. Here’s my full Mvelopes review, or you can click here for a free 30 day trial of Mvelopes. Personal Capital: Personal Capital is much more detailed than Mvelopes, and is more centered on helping you with your investing rather than your budgeting. You can track your net worth, cash flow, investments, retirement planning, and more. Personal Capital pretty much picks up where Mvelopes has left off. They even offer a free version of their services. Check them out here. Blogging: This is how I make good money from home while being a stay-at-home mom, and I love it. 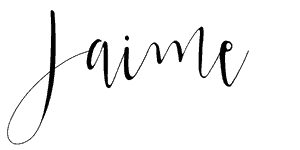 If you’d like to learn more, read my post about How to Start a Blog. It’s actually quite easy to get started! Keep researching afterwards and learning how to do new things, one thing at a time. You’ll keep getting better, and your income will increase each month. I'm Jaime, a pastor's wife who's seen too many families struggle with money. I'll help you finally be able to break free from debt with my printables, tips, and more! Read more about me here. You can do this! I'm so glad you're here!